Being pregnant has me lusting after "things". I know it's material... I also know that as this is my second child that we don't actually "need" many new items... but sometimes it's so hard!! It might be a new product that's been introduced to the market since Ethan, or just something by a brand I wasn't aware of before.. I'm much more absorbed in "baby/child land" these days. When I was pregnant with Ethan I knew little of all the products out there. None of my friends had children. It was a new world to me! I've discovered things as I've gone along. Some of the items we bought when expecting Ethan turned out to be useless or unnecessary. I feel this time around I know what we actually "need". However, sometimes there are some luxury products out there I just can't help lusting after..
One such product is the beautiful cot made by Stokke, a company who manage to combine practicality with timeless style so well. I always loved their Tripp Trapp high chairs but couldn't justify the cost first time around.. the high chair we did get was OK but I never loved it... this time around, I'm hoping can find a bargain Tripp Trapp (either new or second hand). Anyway, back to my original point... the high chairs were the first Stokke product I discovered.. but in the last year or so I have become very aware of their cot, "The Sleepi". Like the Trip Trap, one of the key aspects for this product is how it "grows" with your child. 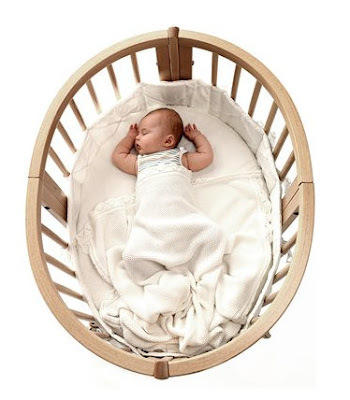 This cot is suitable from birth and using additional parts can "grow" with your child until approximately 10 years of age. Impressive stuff if you don't want to be worrying about a toddler bed and then a children's bed! Another appealing feature is that it's a wooden cot (available in four different varnished finishes) and made from renewable wood sources. The Sleepi is aesthetically pleasing as well and so DIFFERENT! It's oval and just looks so snug and cosy for a newborn. As Stokke themselves say "it creates a nestlike environment that is comfortable and secure". I can well believe it! To be honest, I want to snuggle into one myself. When we had Ethan we were offered a cot by my sister in law. She used it with her son but because he mostly co-slept it hadn't been used a lot. Happy to save money we took up her offer and as a result we never had to consider buying our own. It was a good cot! Ethan slept in it from birth until two months before his third birthday. It served us very well.... I can't deny though that I would love to be able to buy a sleepi for baby two but unless we win the lottery, I can't see that happening. The Sleepi retails at around £399. Not a bad price for a cot and bed in one, but we can barely afford a UK holiday this year, so I know it's not realistic for us :( However, one of the aspects I enjoy most about being pregnant and having a baby is the dreaming.. So, for now, instead of having a baby who will dream in a Sleepi, I shall dream about owning one!! We bought the Stokke Sleepi for our baby who's due in two months. It's quite pricey considering we're buying it in Canada, but I was so obsessed with the shape and I kept going back to it when looking at all other cribs. We also indulged in the Trip Trap, but as its the 40th anniversary, we managed to get an anniversary edition of the chair (new) for about half the price of the regular chairs. I imagine they have the anniversary chairs in the UK as well. I love these diapers. When I first started using diapers I bought a pack of honest one. The fuzzi bunz are a lot more money so I wanted to try honest. I quickly found out why honest is good. No leaks.